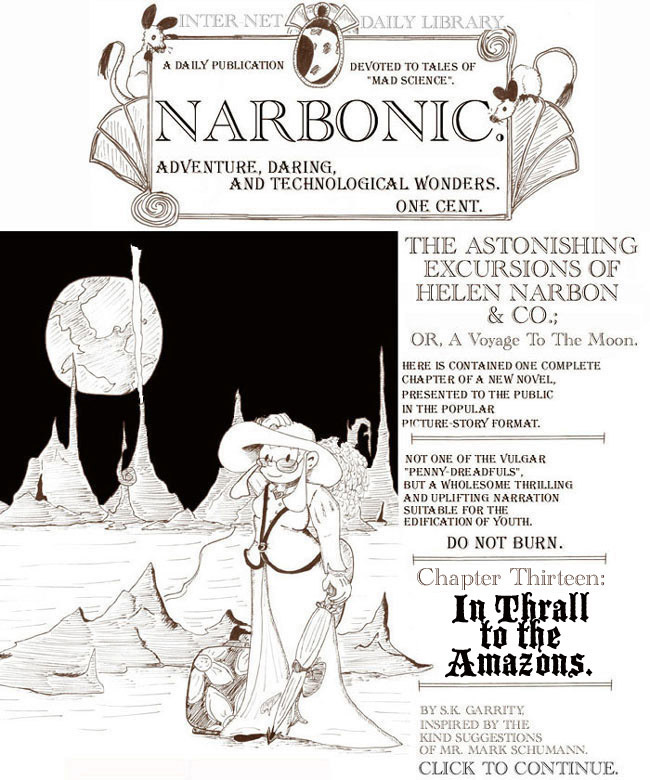 The Astonishing Excursions of Helen Narbon &Co., Chapter Thirteen. Terrible fills here, but otherwise this is a pretty good page. The Martian spaceship is based on a Victorian sci-fi illustration, but now I can’t remember where I found it. Sorry. 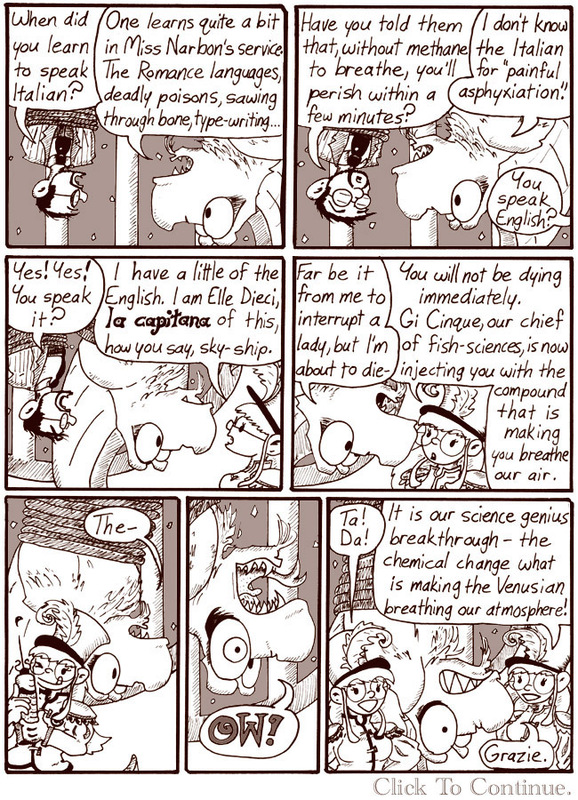 In the last panel, Dave says, “Sergeant–you’re going to kill me at midnight, yes?” Again, Andrew, who is not especially fluent in Italian, did all the translations for the Martians’ dialogue. We apologize for any and all inaccuracies. This is one of my favorite chapters in the Victorian storyline. The dialogue still cracks me up. Dave and Madblood nearly always play off each other well. Typewriting was a cutting-edge skill in the Victorian era. In Dracula, Mina’s ability to type and take shorthand is a major asset to the team. Sawing through bone is always a useful skill for one of Helen’s henchmen to have, whatever the era. “Elle Dieci” and “Gi Cinque” are Italian for L-10 and G-5. All the Martians have serial-number names like that. “Mad as a glass herring” is one of the best phrases I ever came up with, and I want the world to acknowledge it and validate me. Thanks you. 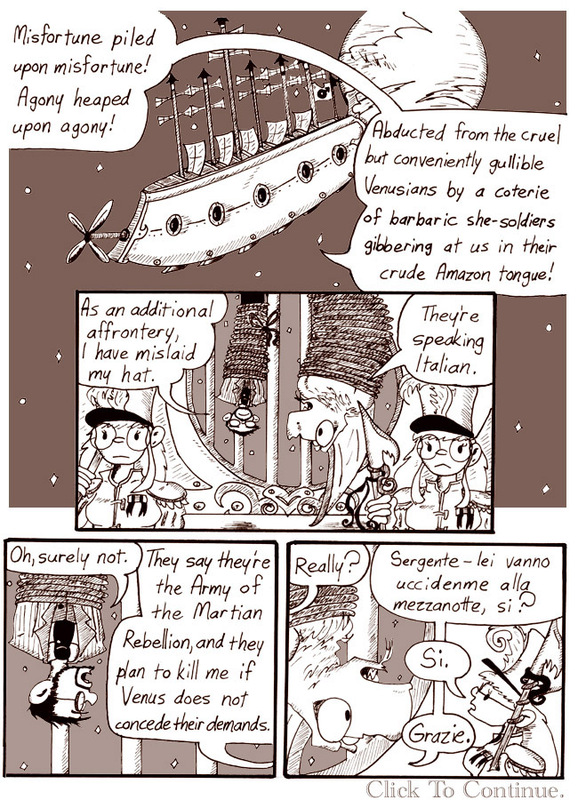 In the second panel, you can tell I just made the background shapes by tracing my French curves. I never did figure out how to use French curves correctly. There’s a correct way to use a French curve? Huh. Oh, those hatless scientists, my word. I’d still like to know what miracle is keeping everybody’s spectacles from suffering the same fate, though. Soldiers of the rebel army, come for war! Soldiers of the rebel Martian corps! For your most excellent phrase, you are hereby acknowledged and validated, Sarge. Consider youself acknowledged and validated, in that I just registered to say so. That whole exchange (panels 4 and 5) is one of my favorite moments in all of Narbonic – and a large part of the reason I’d love to see the Victorian storyline in print. See, I thought “mad as a glass herring” was a real period expression. So you suckered me in, at least. Well, “mad as a hatter” is, which is why Alice in Wonderland had a Mad Hatter. “Mad as a glass herring” is also highly inaccurate–all of the glass herrings I’ve ever known were quite happy and not mad at all. Not even a little miffed!